City mentioned with Lod and Ono (Ezra ii. 33; Neh. vii. 37; xi. 34, 35). From the last-given passage it would seem that Hadid was a Benjamite town, though it is not given in the list in Joshua (xviii. 21-28). An "Adida" (="Hadid") is mentioned in I Macc. xii. 38, xiii. 13 as having been fortified with gates and bars by Simon the Maccabee. The Mishnah ('Ar. 32a) says that Hadid, as well as Lod and Ono, had been surrounded by walls from the time of Joshua. 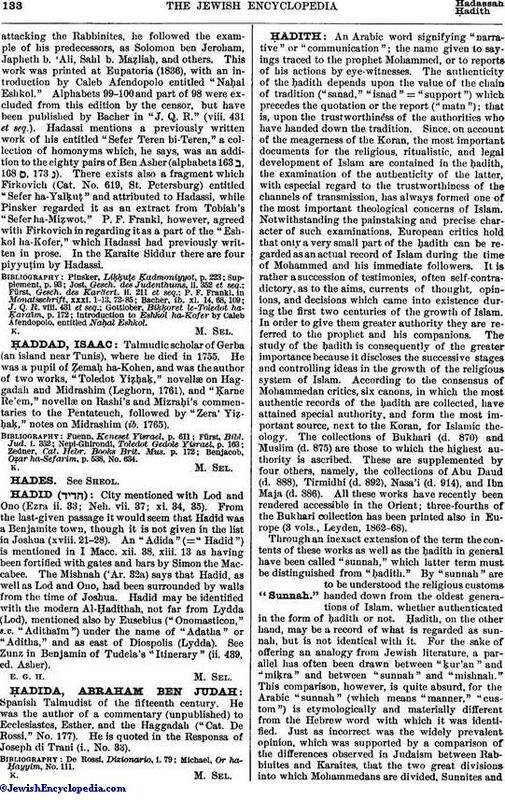 Hadid may be identified with the modern Al-Ḥadithah, not far from Lydda (Lod), mentioned also by Eusebius ("Onomasticon," s.v. "Adithaïm") under the name of "Adatha" or "Aditha," and as east of Diospolis (Lydda). See Zunz in Benjamin of Tudela's "Itinerary" (ii. 439, ed. Asher).